Anyway, there's a modern version of this going around and now it's landed on the left, unfortunately. 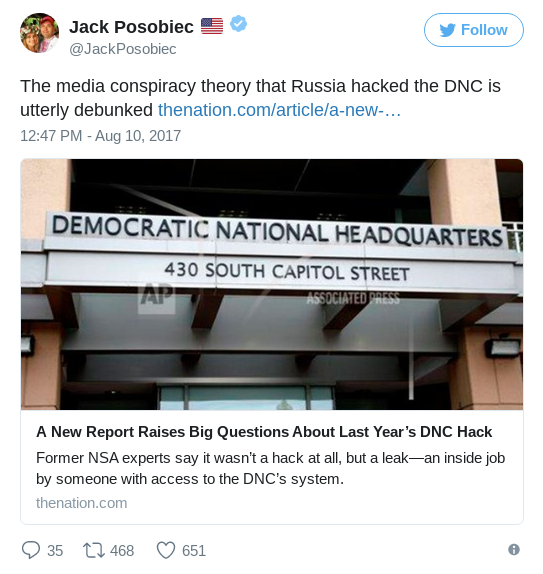 The Nation has published an incomprehensible conspiracy theory about the DNC hack that absolves our Russian friends of any involvement. 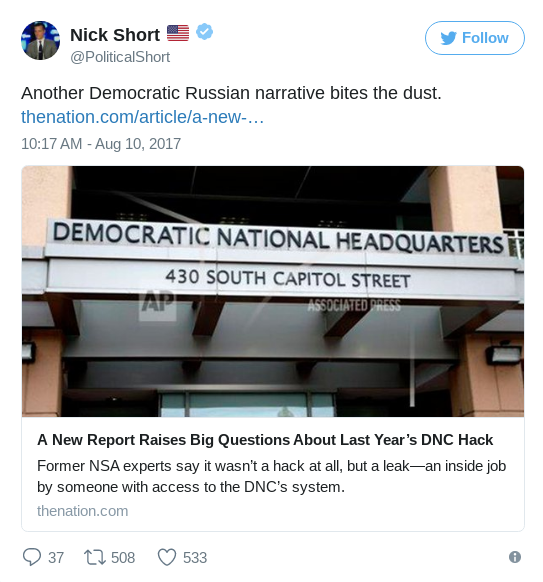 Conclusive proof, or even strong evidence, that the DNC emails were leaked by an insider and not by Russian-sponsored hackers would indeed be a huge story — among other things, it would contradict the near-unanimous opinion of U.S. intelligence agencies, and raise some very serious questions about their objectivity and neutrality. But this article is neither conclusive proof nor strong evidence. It’s the extremely long-winded product of a crank, and it’s been getting attention only because it appears in a respected left-wing publication like The Nation. Anyone hoping to read it for careful reporting and clear explanation is going to come away disappointed, however. If you want to get to the actual claims being made, you’ll have to skip the first 1,000 or so words, which mostly consist of breathtakingly elaborate throat-clearing. 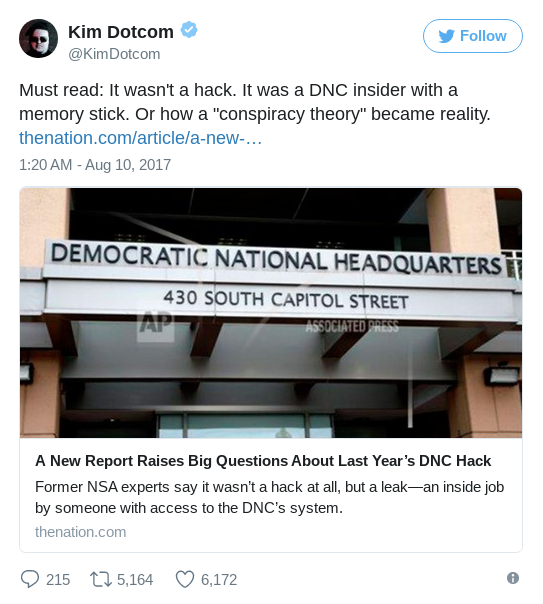 (“[H]ouses built on sand and made of cards are bound to collapse, and there can be no surprise that the one resting atop the ‘hack theory,’ as we can call the prevailing wisdom on the DNC events, appears to be in the process of doing so.”) About halfway through, you get to the crux of the article: A report, made by an anonymous analyst calling himself “Forensicator,” on the “metadata” of “locked files” leaked by the hacker Guccifer 2.0. Read on for why this is not exactly a believable theory. Also, it doesn't explain the Podesta hack or the DCCC hack or all the other hacks of elections systems, but the reaction of right wingers suggests that this is supposed to put this silly Russian business to rest once and for all so we can go back to celebrating Trump's awesome populism and isolationism. If that's your thing, enjoy. I think I'll rely on the obvious until proven otherwise.